Then when I tell people that I’m also a VA or “virtual assistant” their eyes usually glaze over completely. Most people aren’t even aware that VAs even exist, let alone what it is that we do. So I thought I would share a bit about what my work entails and what a day in my life looks like. Immediately after I wake up, I check my email. Usually while still laying in bed! I am a sub-contractor which means I work under another VA. I check to see if she’s sent any emails or urgent messages while I was sleeping (I’m on the west-coast, she’s in the eastern time zone). After I make breakfast, I check messages again. If I have fires to put out, I deal with those first. I respond to any PR requests or sponsored activity. After I eat, I’ll respond to comments on blog posts as necessary. Sometimes I need supplies for blog posts. If its a sponsored post or a review, I might need to pick up the product. When I do that, I am reading on my phone requirements of the campaign, perhaps emailing the contact of questions. Sometimes I’m doing research for a blog post, looking for supplies for a recipe or DIY project, etc. If I’m at a store, I still need to be able to access email and the internet. This is a crucial part of my job because it allows me to price compare, research products, and respond to emails. My VA clients don’t care if I’m out at the store…their problems take priority! My husband and I share a car, so if it has to be taken for an oil change or repairs, its on me to do that during the day. Again, I have to be connected all the time, so when I do that I rely on my phone again for emails and internet. When I get home, I cook dinner. Of course my phone doesn’t leave my side. I’ll respond to emails as needed and then sit down to do more work after dinner. Once I am back in my office at home, I will do the bulk of my writing, photography if needed and editing. 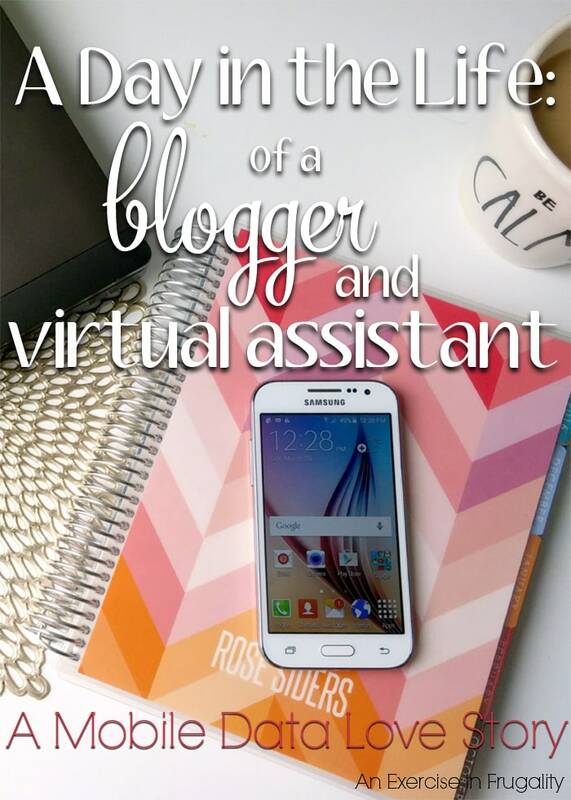 I schedule social media for my own blog as well as my clients’. Even if I’m sitting at my computer there are still things I access on my phone, like Instagram posts for example. I often work late into the evening. Not necessarily because I have a massive workload (though that’s sometimes the case) but also because I feel like I hit my stride in the evening. Even when I go to relax and “unplug” in a bubble bath I still have my phone with me in case something pops up that needs immediate attention. Now, we do have Wi-Fi at home and at the office, however there’s a LOT of time in between while traveling or running errands (plus sometimes, you just gotta get outside!). When my husband and I go anywhere, we’re 20 or so minutes to the nearest town. If he’s driving, chances are I’m using my phone in the passenger seat to check email, address work issues or taking conference calls with clients. As you might have guessed, this uses up a LOT of data! I have to have a plan that includes unlimited data (and a reliable smartphone). 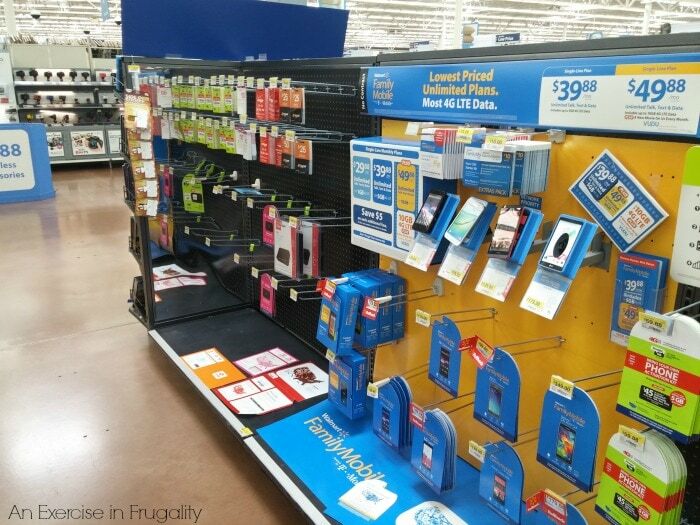 Recently, I was given the opportunity to try out Walmart Family Mobile Plus plan, which includes unlimited talk, text, & data with up to 10GB of 4G LTE data PLUS a free movie on VUDU ($7 value) every month per line. I can’t wait to watch my free movie on my tablet. (I could TOTALLY use a movie night!) I knew it would be perfect since my current data plan is only 1GB! And can you believe its only $49.88 a month? I’m paying almost that much for 1GB currently. Clearly this is a much better value. 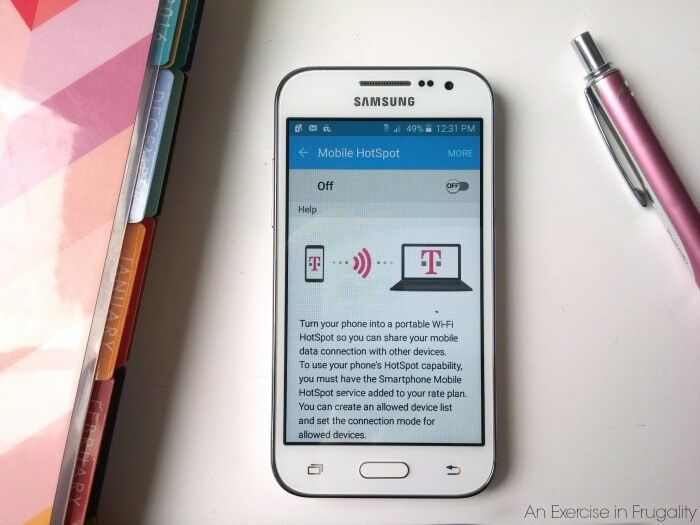 With this plan, I get up to 10GB of data, meaning I can use my phone as a Wi-Fi Hotspot without fear of data overages. Since I am constantly on the go, this is the perfect plan for me because it means I can work anywhere! If you have teens or anyone in your family who is tech savvy (and constantly racking up data charges) you should check this out to lower your overall cost. My previous cell phone plan gave me only 1GB of data a month. It was useless as a hotspot, and I was always going over! I really like the Samsung Galaxy Core Prime and I was able to grab it on Rollback for only $72.92 (regularly $99.92)*. There’s a $25 Starter Kit that contains the required SIM card, and then you’re on your way. They have a variety of phones and all of them were totally affordable. 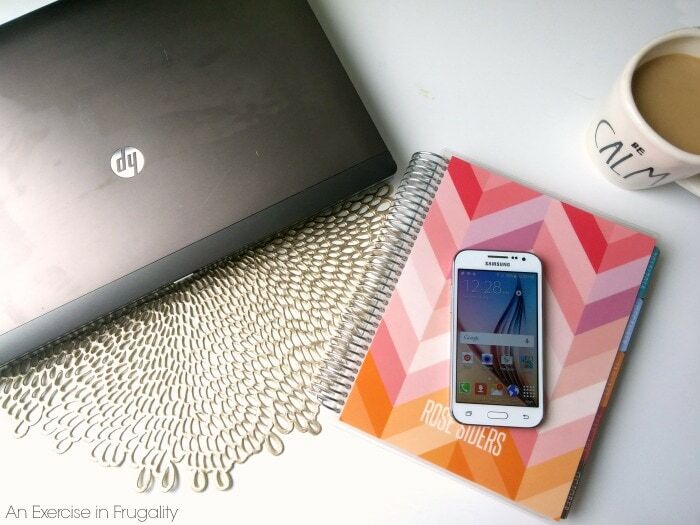 I chose the least expensive phone because…well, I AM a frugal blogger after all! But they did have a great selection of phones for any price range. The plan I chose also includes a free VUDU movie each month, which of course is awesome as well! I love the unlimited talk, text and data. It helps me manage my work no matter where I am. If you’re thinking of using your tax return to buy a new device, or are looking to switch your data plan, this is definitely one you want to consider. It’s a great value for the money, and you still get the benefit of 4G LTE. *Disclaimer: All prices for phones and plans included in this post are accurate as of the date of posting; however, these prices are subject to change. Please refer to https://cbi.as/2-ovk or your local Walmart for current pricing. What would you do with unlimited mobile data? That’s awesome. I live like two blocks from Wal-Mart so I’m always there. I actually have two phones one for personal use and one for business so for my personal I use MetroPCS. Not sure if you have one in Oregon but we do in Nor Cal, everywhere. It’s only $40 a month unlimited everything. The other is a plan (yuck) through Verizon it’s for my iPhone which I love but hate the contract. I would love to work with you sometime as a guest blogger. Or if you would like to guest post on my blog, started this blog in Nov. 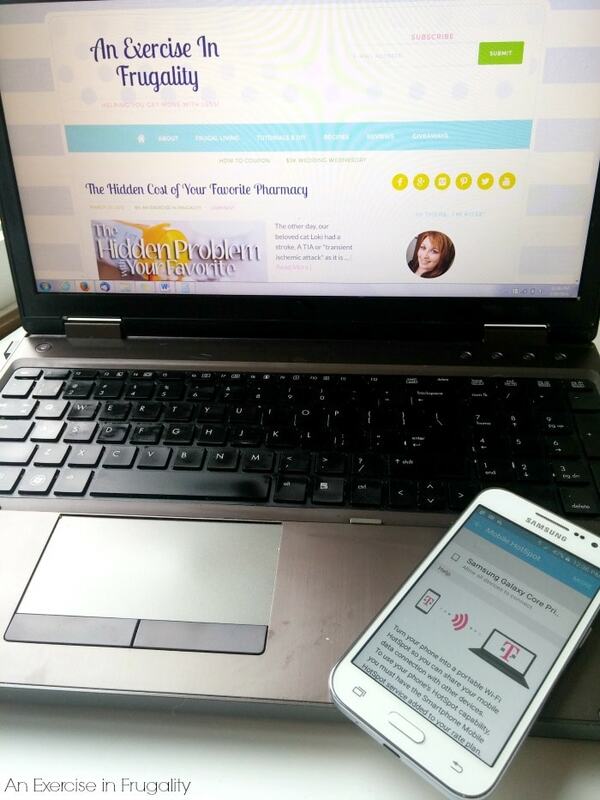 But I’ve been blogging @mommiesfrugalfinds.blogspot for years. I would love a post on what you do as a VA. I actually didn’t know what the heck a VA was either until five years ago in college I needed an elective and saw this class, I had no idea what it was but was intrigued. That’s how I got introduced to the concept. I also do VA work. I think it’s a lot more mainstream now so hoping we won’t be getting those “eye rolls too much longer”.